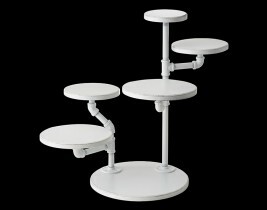 Handcrafted in the USA of industrial pipe and wood, these display stands offer height and mobility for visually pleasing presentations. 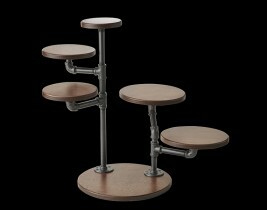 Available in three distinct finishes, the pipe arms are moveable and can be adjusted for a variety of display options. Great for a multitude of uses from coffee & tea service to pastries & small appetizers, you can accessorize your display stand with an unlimited variety of small plates, cups or dishes that Steelite has to offer.